BFREE has developed a 13+ acre certified organic shade-grown cacao and coffee experimental agroforest located within a short walk from the main facilities. The farm was planted in 2006 out of an interest in sustainable agro-forestry and a desire to explore the potential for BFREE to grow and produce organic chocolate both for economic purposes and as another teaching resource as part of BFREE’s mission. Some of the cacao seeds produced are processed onsite and used in the BFREE kitchen, some are donated to farmers interested in planting agroforests, some are planted in the BFREE nursery, and others are sold for planting and those funds are used to continue to sustain the project. Belize is home to nearly 600 species of birds. Migratory bird populations are in decline in large part due to habitat destruction from deforestation both in their winter home in Belize and their summer homes in North America. Efforts are being made to protect these birds in North America, but the efforts will be unsuccessful unless the birds’ habitat in Belize is also conserved and restored. 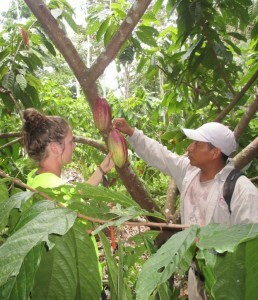 A student helps BFREE Cacao Farm Manager, Elmer Tzalam, harvest a cacao pod during a tour of the experimental farm. Migratory songbirds journey thousands of miles, twice a year, between their summer home in the north where they build nests and raise their young, and their winter home in Belize where they gain weight and strength for their long journey north to breed. 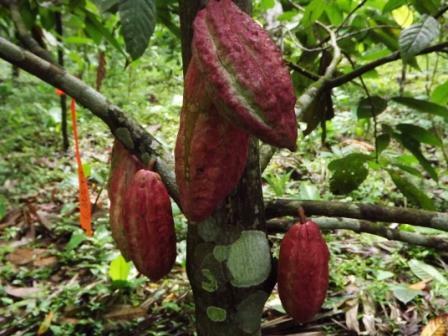 Unlike pineapples, bananas, and citrus, cacao can be grown under a mixed forest that provides feeding and resting habitat for migratory songbirds and nesting habitat for resident birds. Some of the many species of migratory birds that benefit from habitat conservation in Belize are the Red-eyed Vireo, Yellow Warbler, Chestnutsided Warbler, Northern Waterthrush, Grey Catbird, Least Flycatcher, Eastern Kingbird, Wood Thrush, and Kentucky Warbler. Migratory and resident birds help regulate insect pests, disperse seeds, and pollinate a variety of crops. They are also beautiful animals, which attract thousands of bird-watchers to Belize from around the world each year. BCARP farmers developed a common nursery for seedlings. 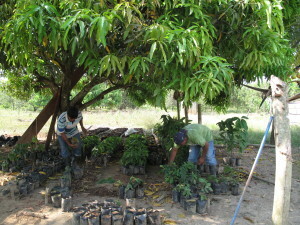 Trees stay in the nursery for five – eight months before being transplanted during rainy season. BCARP is a five-year project spear-headed by the U.S. non-profit, US for Belize Foundation for Research and Environmental Education (BFREE), to convert degraded land to cacao-based agroforestry for the purpose of expanding migratory bird habitat primarily in the Trio Agricultural Community, Toledo District, Belize, Central America. This program was initiated in October 2012 with funding from the U.S. Department of the Interior, Fish and Wildlife Service, on behalf of the Nyanza Natural Resource Damage Trustee Council – comprised of the Service, Commonwealth of Massachusetts and National Oceanic and Atmospheric Administration – through a superfund settlement for mercury contamination that severely damaged migratory bird summer breeding habitat. The portion of the superfund settlement designated for restoring the migratory bird habitat in Massachusetts includes funding for restoration and conservation of the birds’ winter habitat in southern Belize. By using a portion of the settlement to fund cacao-based agroforestry, the USFWS hopes to increase the numbers of affected species by restoring both winter habitat in Belize and the nesting grounds surrounding the contaminated site. Trio borders BFREE reserve land on the eastern side. Residents of this community are primarily Spanish-speaking immigrant farmers from Guatemala, El Salvador, and Honduras who were each granted 30-acres of land in 2007. Farms in this area include citrus, pineapple, plantain, corn, and cattle. Some of the land has yet to be converted and is second-growth forest.